Discussion in 'Gambling and Betting Forum' started by JimGunn, Apr 8, 2019. This one starts at 1am and finishes at 6am for me. I might wake up for the main event. Alot of Alistair's fights have the same story arc, he is winning then he gasses and he gets stopped or nearly gets stopped. Probably worth getting up for to see if there are LB opportunities. Although not sure how good Oley's gas tank is himself. He is an old fella. This appears to be a difficult card to bet. 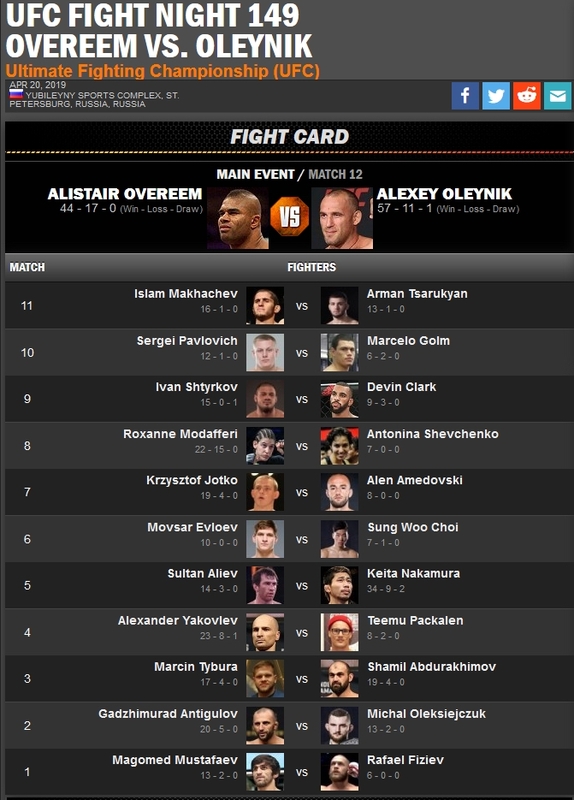 I'm waiting to see how they release the total for Overeem/Oleinik. I think the Over 1½ will be good if a decent price. Some +126 still out there on Shamill. Shamill by decision is likely, especially in Russia. I'm shocked there's so much support for Roxy here. Thought Antonina would be -500 by now. Gotta put some on Choi at +310 with that size discrepancy over former M-1 bantamweight champion Evloev in this featherweight bout despite the latter's wrestling advantage. Holy line movement. I ate major chalk and threw down a lot of money on Antonina at -325 & -330 when her price was -350 at multiple books. And then by coincidence started seeing the prices tighten immediately. Added more at -294 thinking I was getting a steal. And now I see she is as low as -270. Roxanne couldn't get much done against Sijara Eubanks, except for a late armbar attempt. I believe Antonina has at least as good striking as Sijara does and should have the sub defense to avoid getting caught and enough athleticism to keep it on the feet or stand up again if taken down. Whats the point of weigh ins if you fags wont take off your shirts. Vaughany and lucky like this. Waking up at 4:30am to donk off $300 live. Baby jesus lol. Hope u all did ok.
Reading play by plays, Roxy was a missed opportunity. She did look quite good at weigh ins.